Die offizielle EVE Online Seite. Die deutsche EVE Online Forum. EVE Karten, Allianzen und Navigation im EVE Universum. dotlan Jump Planer, Jump Range Planer und Routen Planer. Eine umfassende EVE-Online Markt Datenbank. EVE Marketer ermöglicht einen Regionen übergreifenden Preisvergleich. Eve Who listet einfach die Piloten von Corporations und Allianzen auf. 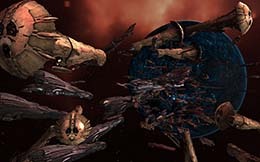 Eve Radio is an Internet radio station broadcasting live music and talk to the players of Eve Online 24 hours a day, 7 days a week. Wormhole List - Displays wormhole names, wormhole types and max stable times. The post April Streamer of the Month appeared first on INN. On the 10th October YC120, at around 13:20 a collection of lowsec and Nullsec entities ambushed a mixed-tank The Initiative[INIT.] supercapital fleet in the system of D-B7YK over an Azbel. Last week, on April 8 2019, we announced the permanent banning of Brisc Rubal and their ejection from the Council of Stellar Management. We also issued one-year bans to two other players involved in this incident and confiscated their associated in-game assets and ISK.